In the United States there are 3,000 kinds of spiders. They live in all parts of the world. Spiders have value for their role as predators and natural regulators of insect populations. 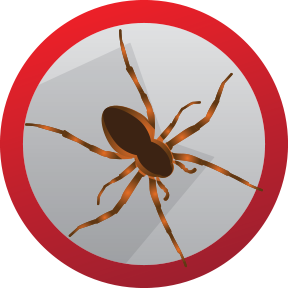 However some spiders when found in or around structures, can be considered pests, particularly those that are poisonous. Fear of spiders goads many people to insist on their control even if the spider represents no significant threat or problem. The shape of a spider is well known. The head and thorax are combined to create the cephalothorax. The cephalothorax has four legs that are attached to each side of it. Spider’s eyes are in the front and they have no antennae. While all spiders are poisonous to some degree, few bite humans. The rear opening is located near the end of the abdomen, and nearby are some short appendages called the spinnerets. Silk webbing threads out from the spinnerets. All spiders produce silk, and they use the silk they make in more interesting ways than most other silk producers. Some of them make silk retreats like tubes and funnels. While others make irregular cobwebs or the evenly spaced, spiraled great orb webs.